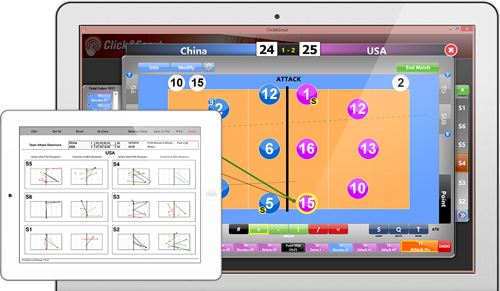 Scout basic stats like serve, receive and attack with directions: all in real time on your tablet. A great tool for your team! 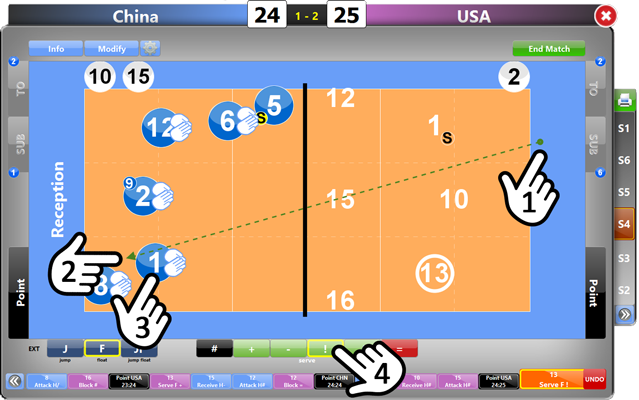 to follow with a touch the trend of the game from the bench and to have an easier version of the match to hand. The system is now available for operating system such as iOS, Android, Windows and Mac and you can scout using any tablet or computer. thanks to the simple data just collected. 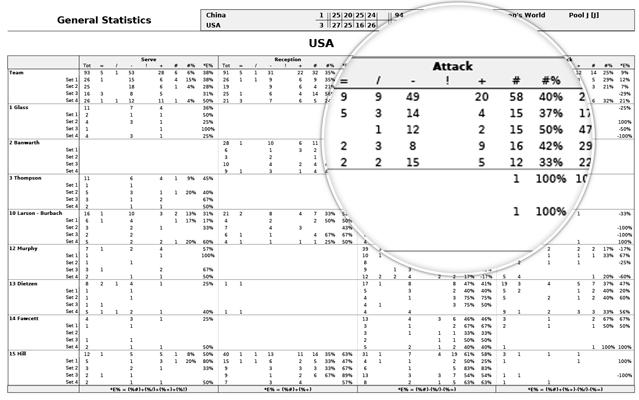 Basic statistics allows you to get useful info to evaluate athletes performance, while the attack and serve directions help you to adapt the game strategy in real time. but also Beach Volley and Green Volley. 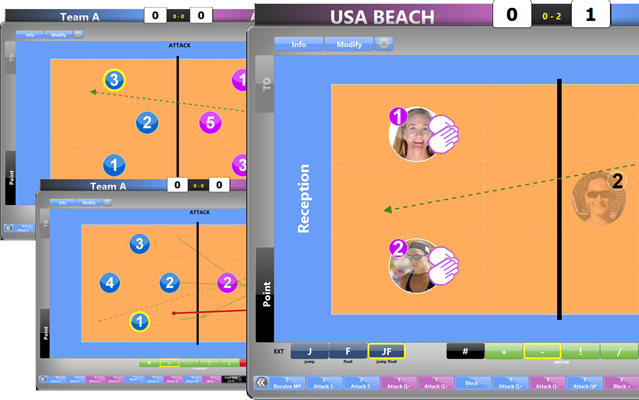 Use the software potentiality to customize the system and to transform the court with a click, changing the players number and positioning. 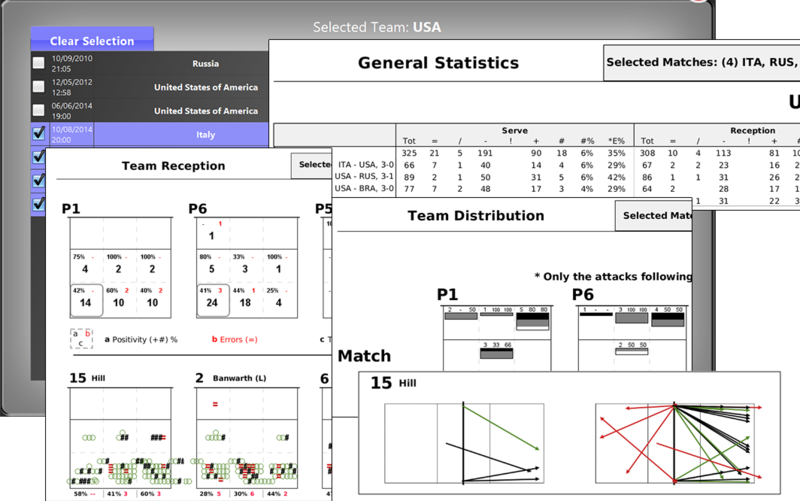 with other Data Project software: you synchronize the scout with the footage of the match and watch videos of rotations and statistical data with Data Video Essential, you get an in-depth analysis both individual technical and team tactical with Data Volley. 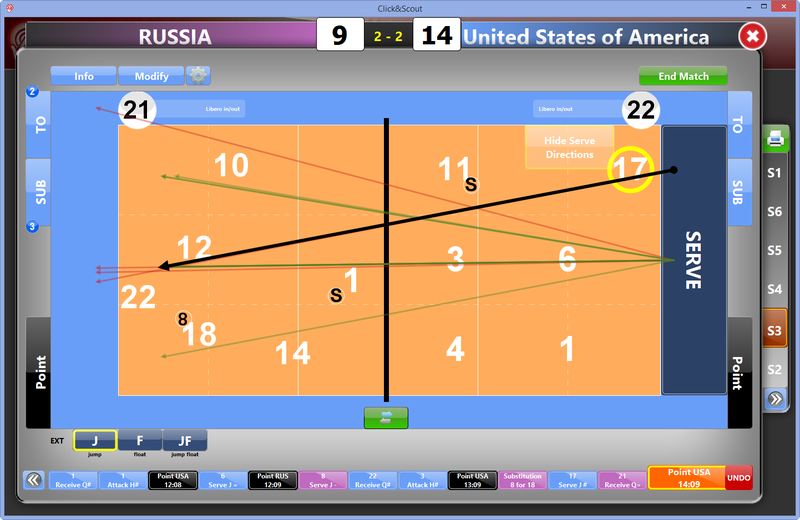 By clicking on the virtual court, the program will show you the sequence of skills and location where they are performed. Without any additional efforts the attack directions are automatically recorded and different colors are used to differentiate the skill results; helping you to read and analyze the relevant data quickly. Scout all the attacks and blocks during a rally! You are able to see all of a player's serves and their directions before each rally, which allows you to better understand and analyze their tendencies. Having recorded this information, you can share it with your team and make positional and formation changes. 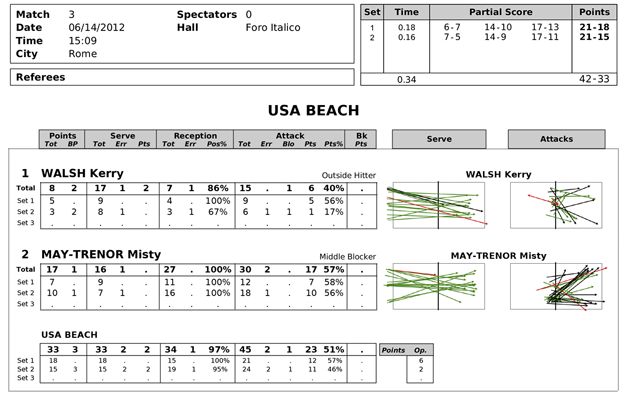 The statistical report gives you immediately a complete view of the whole match. General stats show the individual players' performance. 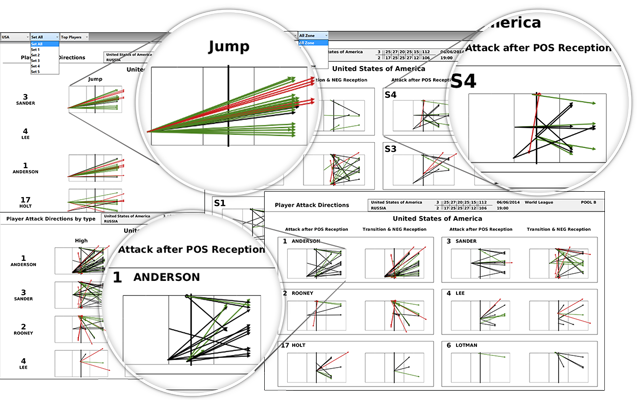 Attack is divided and analyzed by player and in the different phases and rotations. Nothing is left out. 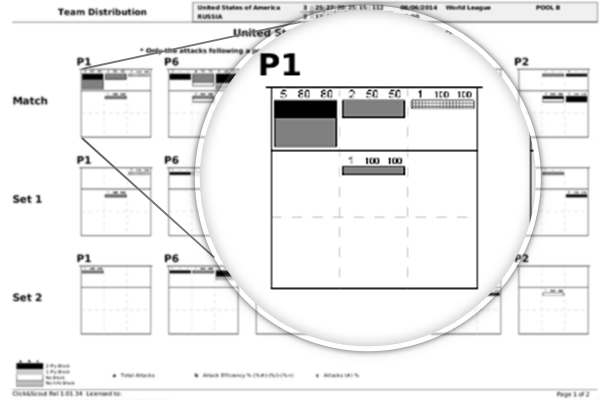 You can evaluate the performance of one or more players during each set and by rotation. 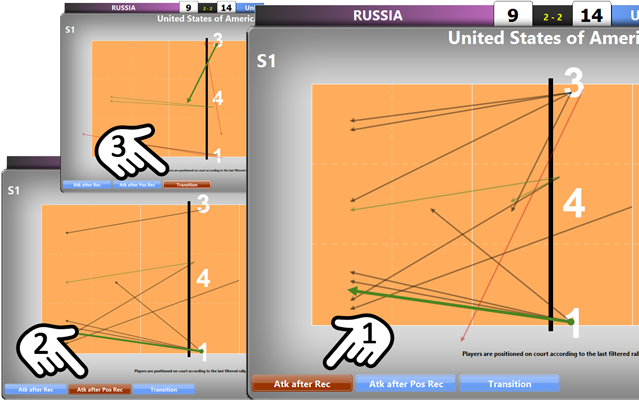 Accurate analyses allow you to evaluate the opponent and your team's performances during a match. 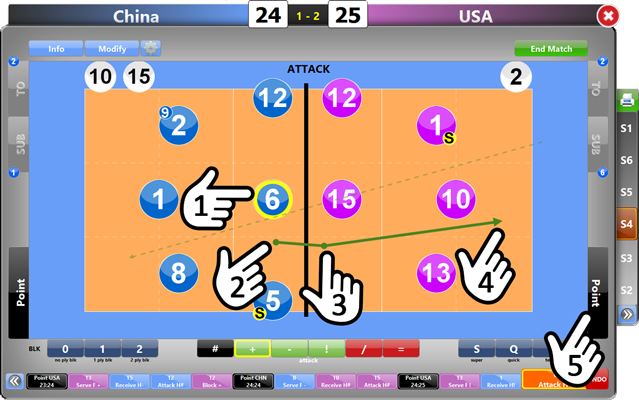 Information such as setter zones, receiving efficacy by zones, serve and attack direction tendencies, which will help you to make better decisions during the match. Where is the opponent attacking? In which rotations are we struggling with the block? How is our setter playing? With which set do we have the most options? You find answers to these questions and many others in the Team Distribution section. Find and focus on where in the formation the opponent's reception is the weakest or which rotation they struggle. 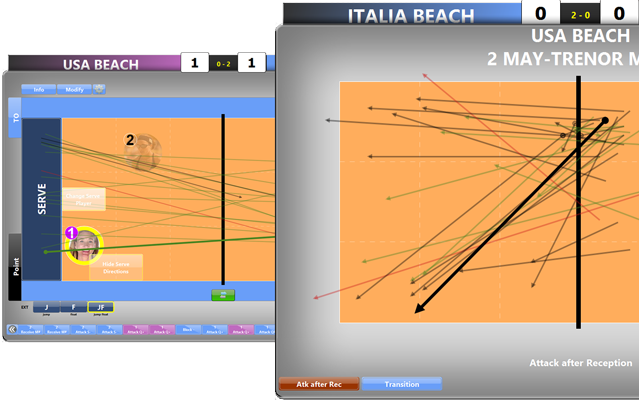 Know where your team receives the highest number of balls and the effectiveness of your attackers in reception. Compare the data from multiple matches by measuring the results against goals that you want to achieve. Check your team's performance at any time by analyzing the skills with poor performance after losing a set. Compare the current stats with those from a previosly played match. There are no limits to how much data you can analyze. 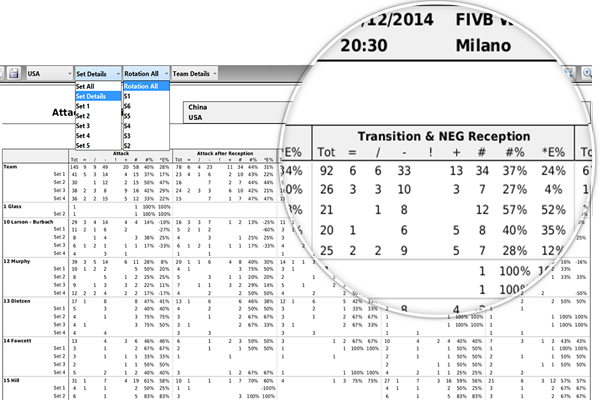 Analyze data from multiple matches on a single page, which helps you prevent missing any detail or trend. Beach Volley and Green Volley also have the same ease of scouting. Choose the regulation and the teams according to the type of the tournament; and scout the match. 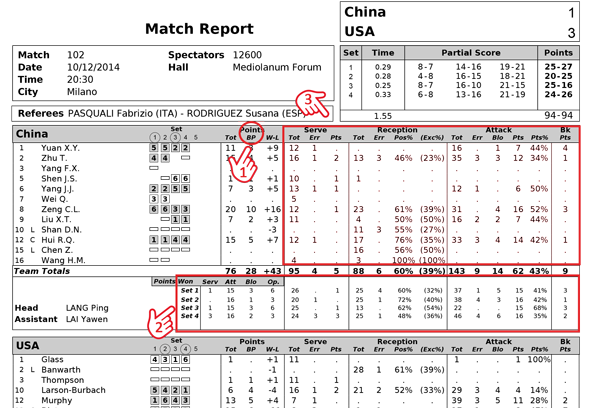 Print the statistical report if you would like to analyze data in the same way as an indoor match. 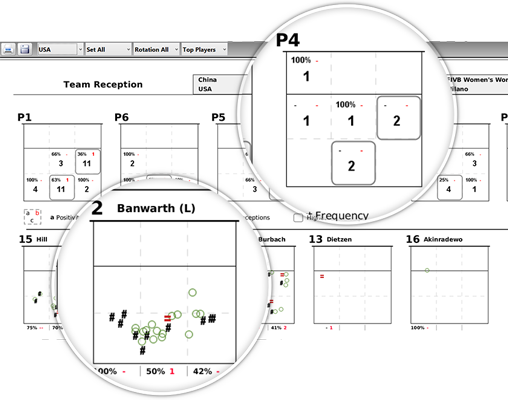 Examine the smallest details of performance from your team by analyzing stats, game situations and attack and serve direction tendencies. Click&Scout is a multi-platform software, which can be used on Windows (not RT) tablets and iPad (iOS 6 and above). It can also be used on Windows OS and Mac OS desktops and laptops. Click&Scout offers different language options allowing you to choose the most comfortable display language for your scouting needs. Finally, the scout file produced is completely compatible with Data Volley. Windows OS: from Windows XP to Windows 10. You can’t add any more codes once a team has reached 20 points. After that, the last code will always outrule the previous one. You can’t scout more than 200 codes. The purchased license is valid for 12(twelve) months from the activation date (for example: you can activate it on 1st September 2014 and it will expire on 1st September 2015). At the end of these 12 months, the software will stop working until you activate a new license. The software license can be activated on 1(one) device for one year. The license cannot be transferred and activated onto another device, unless you purchase a new license. During the duration of your license you will be able to download, free of charge, all software updates. Updates can’t be downloaded if the license has expired. Warning: if you format the device, the license stops working and you will need to purchase a new license. You can purchase a license renewal at any time, but it can only be activated during the last 30 days of the current license. If you update the license during the last 30 days, the software will automatically extend the expiry date to a year taking into account the days left of the current license (for example: if you update the license, but there are still 25 days remaining, when you launch the software you will have 1 year and 25days left). 1 - I would like to purchase Click&Scout, but I don’t have a touch screen device. Does a PC/notebook version exist? Click&Scout is compatible with all pc/notebooks that use Windows and Mac, and not necessary with a touch screen as it can also be used with the mouse. 2 - Is it possible to install Click&Scout on iPad? The iPad lite version is available on the App Store. 3 - I currently use the version for Windows/Mac on notebook, but I am thinking about buying an iPad/tablet. Can I transfer the license to another device? No, you cannot transfer an active license. You will need to purchase a second license or when your license expires renew it and activate it on the new device. 4 - Can I activate a Click&Scout license on two computers? 5 - I would like to scout a match tomorrow evening using Click&Scout. If I purchase it now, how quick will I receive it? When you purchase Click&Scout you will be able to use the product almost straight away. When you have completed the payment via credit card you will be able to download the installation setup straight form the website. In the mean time you will receive an e-mail with the activation code. I have received the e-mail with the activation information, but the program will not accept the purchse code. Make sure you have entered the purchase code correctly and remember to include all symbols in the e-mail (the code usually ends with ==). Make sure there are no blank spaces before the code, we suggest you copy and paste the code from the e-mail to avoid typing errors. 6 - I have just downloaded and installed Click&Scout, but an error message appears when I try and launch it. Dowload the setup file for the last version from the Download section. Save the ClickScout_Setup file in any folder on your computer or desktop and launch the installation as administrator (right click on the file icon and select ‘’run as administrator’’). If the problem persists, uninstall Click&Scout, disable the antivirus and install the program as administrator (right click on the file and select ‘’run as administrator’’). Once complete restart the computer. Once you have done this, restart yout computer. If you use the ‘’Avira’’ antivirus you may need to uninstall it. 7 - I have carried out Windows updates and Click&Scout is not working. From the Download section download the last version of Click&Scout, launch the installation as administrator (right click on the file and select ‘’run as administrator’’). Once complete restart the computer. 8 - I launched Click&Scout today but it went into Trial mode although it had already been activated and used previously. In this case there is no point entering the activation code as it is already being used. Download the last version of Click&Scout from the Download section and launch the installation as administrator (right click on the file and select ‘’run as administrator’’). 9 - I tried to fix my problem following the FAQ but the problem is not fixed. Contact Data Project and request remote assistance, available Monday to Friday from 10:30am to 12:30pm and from 4:00pm to 6:00p (italian time). You will need your computer and an internet connection. 3 - Re-try installing the ClickScout. 11 - Can I upgrade to the latest iOS iPad? 1- Log in the personal area of this site and click on the RESET iPad. license. WARNING: The License for iPad is available for purchase ONLY through the Apple AppStore.